Davisson attended the Bloomington public schools, and on graduation from High School in 1902 was granted a scholarship by the University of Chicago for proficiency in mathematics and physics. In September of that year he entered the University of Chicago and came at once under the influence of Professor R. A. Millikan. In September 1905, on the recommendation of Professor Millikan, he was appointed part-time instructor in physics at Princeton University. This post he held until 1910, studying, as his duties permitted, under Professor Francis Magie, Professor E. P. Adams, Professor (later Sir) James Jeans and particularly under Professor O. W. Richardson. During a part of this period Davisson returned to the University of Chicago for the summer sessions and in August 1908 received a BS degree from that institution. He was awarded a Fellowship in Physics at Princeton for the year 1910-1911 and during that year completed requirements for the degree of PhD which he received in 1911. From September 1911 until June 1917 he was an instructor in the Department of Physics at the Carnegie Institute of Technology, Pittsburgh, PA. During the summer of 1913 he worked in the Cavendish Laboratory under Professor (later Sir) J. J. Thomson. In June 1917 he accepted war-time employment in the Engineering Department of the Western Electric Company (later Bell Telephone Laboratories), New York City - at first for summer, then, on leave of absence from Carnegie Tech., for the duration of the World War. At the end of the war he resigned an assistant professorship to which he had been appointed at Carnegie Tech. to continue as a Member of the Technical Staff of the Telephone Laboratories. The series of investigations which led to the discovery of electron diffraction in 1927 was begun in 1919 and was continued into 1929 with the collaboration first of Dr C. H. Kunsman, and from 1924 on, of Dr L. H. Germer. During the same period research was carried out on thermal radiation with the collaboration of Mr J. R. Weeks, and in thermionics with Dr H. A. Pidgeon and Dr Germer. 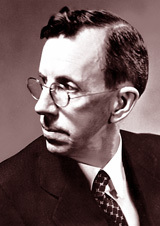 From 1930 to 1937 Davisson devoted himself to the study of the theory of electron optics and to applications of this theory to engineering problems. He then investigated the scattering and reflection of very slow electrons by metals. During World War II he worked on the theory of electronic devices and on a variety of crystal physics problems. The information on this page is based on content at Nobelprize.org © The Nobel Foundation. See also Mervin J. Kelly, `Clinton Joseph Davisson: 1881-1958', Biographical Memoirs of the National Academy of Sciences.